Ilkeston FC have released EIGHT of their first-team players with immediate effect. The Robins have agreed deals with other clubs for two players and released six from their contracts, the decision having been taken in order to reduce costs and also give an opportunity for some of the club’s talented youngsters to progress to the first team squad. Chief executive Nigel Harrop says the move has been made with an eye on future investment in the New Manor Ground club. Defender Joe Burgess has signed for Boston United and midfielder Joe Doyle will join Alfreton Town, both deals including sell-on clauses. It is understood midfielder Eli Bako is close to agreeing personal terms with Redditch United. Burgess and Doyle had an agreement in place that should they attract interest from a higher level the Robins would give them the opportunity to speak to the clubs concerned. Also released from their contracts are defenders Olly Luto and Liam Marshall, midfielders JJ Blake and Charlie Coulson and striker Lee Ndlovu. Five of those leaving the club started the Robins’ match at Blyth Spartans on Tuesday night. Harrop says the Robins have potential investors lined up who are keen to see that the first team can run effectively without large amounts of money having to be put its way too often. With many of Ilkeston’s younger squad players scouted by professional clubs, particularly those involved in the Robins’ successful FA Youth Cup side, it is hoped giving them more first team opportunities between now and the end of the season will make them better assets for the club in the future, which in turn will aid the first team next season. Harrop said: “We want these players to progress to higher levels but it has to benefit us as a club and not just financially. “It has been highlighted again this season with Jordan Wheatley. If you are good enough your are old enough. He gets better all the time as he gains more valuable experience with every game which is good for Jordan and the first team. “Those who have played more in the first team will command bigger fees which can in turn be put back into the playing squad, rather than our investors having to keep putting money in. “Rhys Dolan and Lewis Walker also broke through and attracted interest immediately but we try to find a balance to enable our model to work for the player and the club. “Our young players have confidence in the management and know the club will give them the help to improve but also not stand in their way should an opportunity arise to move into league football. “With us having 42 points it is a good chance to give some crucial first team experience to these youngsters which will benefit us going into next season. “We’re not saying we’ll be playing 17 or 18-year-olds forever - next season could well see a little more experience brought into the side. We started this season with Lee Hughes in the side scoring goals regularly. We feel with the right balance, one or two additions of that sort could turn us into a real force with our talented youngsters. 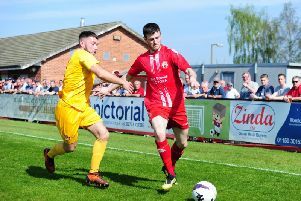 Harrop says he has spoken in detail to current head coach Andy Watson and has been encouraged by the Scotsman’s belief that the teenagers in the Ilkeston squad are good enough to make the step up. He said: “Andy is fully supportive of what we’re doing and firmly believes he has the players at his disposal that can still make an impact this season. He knows he has some very talented youngsters although some are very raw. They play without fear but require guidance. “Also, very crucially, he is aware these youngsters need the full support of our fans, many of whom understand and are proud of our youth model.